Sometimes the best things in life just fall into place. That’s the way Anita ‘Sarge’ Kellman felt about the Beat Cancer Boot Camp franchise. What started as an exercise group to help her own patients take charge of their lives has evolved into a national phenomenon. Spread across eight U.S. states, Beat Cancer Boot Camp provides support, education and camaraderie to cancer patients, survivors and their families. 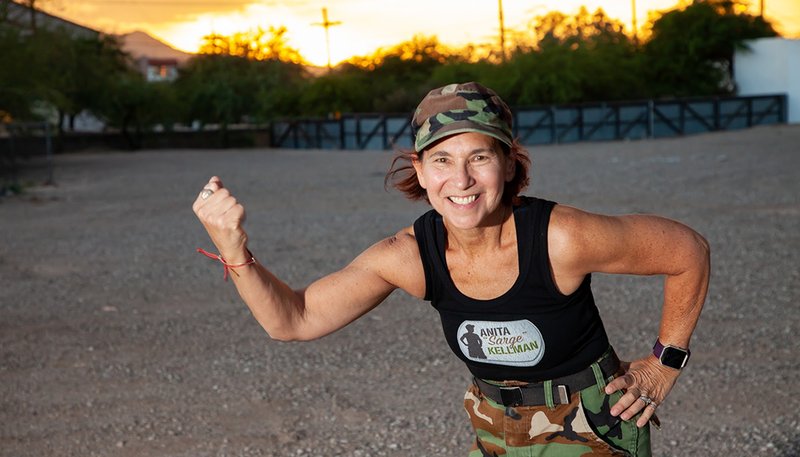 Aside from working as a licensed radiologic technologist and a certified patient navigator, Sarge had been teaching typical boot camp fitness classes before developing Beat Cancer Boot Camp. In 2004, she had the sudden idea to empower cancer patients and their loved ones through a boot camp approach when one of her participants first received a diagnosis. Sarge knew that continuing a physical fitness routine would improve the mental and physical wellbeing of this participant, as well as the quality of life. Realizing that being a part of the group made such a positive impact, Sarge began speaking with her patients and asking if they would be interested in joining an exercise group. After working with an oncologist for years, Sarge knew that another peer support group was not what patients needed. She felt that patients left traditional support groups feeling depressed rather than inspired. Sarge wanted Beat Cancer Boot Camp to be a place where patients were encouraged to take charge of their health and feel connected to one another in a way that wasn’t simply having the same diagnosis. It didn’t take long before word of her program spread and other patients were looking to get involved. Within the first five years, Sarge decided to license Beat Cancer Boot Camp. As the classes continued to grow, Sarge noticed more and more people socializing and making plans outside of class. Though avoiding the traditional support group style, she recognized that the social aspect was missing at Beat Cancer Boot Camp. She decided to start encouraging informal mentoring at sessions and held monthly dinners on relevant topics with speakers addressing things such as plastic surgery or acupuncture. The classes became a place where participants could share experiences as well as take charge of their health. Sarge began seeing her participants become not only physically tougher, but mentally stronger as well. Surprisingly, the Beat Cancer Boot Camp inspiration has spread further than those affected by cancer. In 2013, Sarge received a phone call inviting her to do a segment on second chances for NBC’s The Biggest Loser. Hearing that Beat Cancer Boot Camp was seen as an opportunity for a second chance shed new light on the depth and importance of the program. Sarge’s boot camp has inspired hundreds of cancer patients and their loved ones. She continues to encourage her recruits to challenge themselves as far as they can whilst knowing their limitations. Sarge strongly believes that patients who take charge of their mental and physical stamina are better prepared to win the fight against cancer. If you would like more information about Beat Cancer Boot Camp, or to see if there is a class in your state, visit BeatCancerBootCamp.com. You can also learn more about the program as well as read stories of the participants in Anita ‘Sarge’ Kellman’s book, It’s a Beautiful Day for Boot Camp. Please note that although these stories are featured on our blog, any particular advice, claim, insight or opinion offered by the individuals featured in Faces & Voices of Cancer pieces does not necessarily reflect the position of the National Foundation for Cancer Research. Join a community at FacesandVoicesofCancer.org, launched in October 2018, and share your story while too finding inspiration.